Elon University is celebrating its 125th anniversary, and Dr. J. Earl Danieley, president emeritus, has been associated with the school in one way or another for more than 70 of those years. If there is one individual who personifies Elon University more than any other, it is “Dr. D.” He has been a student, a teacher, a president, and a teacher again, all the while coming into contact with thousands of young people on whom he has exerted a tremendous positive influence. And at 89 years of age in this anniversary year, he shows no sign of stopping. Dr. Danieley has made many contributions to the school and this area in so many ways, but none has been more important than his relationship with the Elon students. Every year when the school opens, he is on hand with his big permenent smile to greet the incoming freshmen, introducing himself, helping them in the move-in and letting them know what a great experience they will have in the coming years, He is usually found on that day in the Danieley Center, a living complex on the east side of campus which was named in honor of Dr. Danieley and his late wife Verona. In the years that follow, many of those students will find themselves in the chemistry classes he continues to teach or in his Elon 101 class in which he fills them in on the history of Elon. And for those who do not have him as a teacher, they will surely have him as a friend, as he is at almost every function the university presents. He is particularly visible at Elon athletic events, giving his support to each and every one wearing the maroon and gold. At basketball games for both men and women, his appearance has become part of the game itself. At the timeout around the seven minute mark in the second half, there comes a chant from the student section – “Doc-tor Dan-ley, Doc-tor Dan-ley” – and Dr. D rises from his seat near courtside and gives a hearty wave with his victory towel. And when the game is over, win or lose, he moves to courtside and greets every one of the Elon players as they leave the court. Dr. Danieley is a native of northern Alamance County, and he attended Elon College in the 1940s, graduating in 1946. He then received a graduate degree in organic chemistry from the University of North Carolina and did post-doctorate research at Johns Hopkins University. He joined the Elon faculty as a chemistry instructor, and from 1953 to 1956 was dean of the college. In 1957 he was named the sixth president of Elon College, making him one of the youngest presidents in the nation. He led Elon until 1973 when he decided to step down and return to teaching. He was elected to the University of North Carolina Board of Governors in 1983 and served in that post for 12 years. 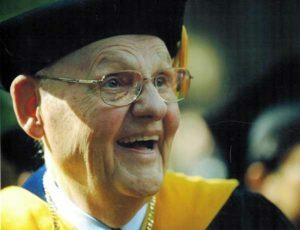 In 1987 Dr. Danieley agreed to cut back on his teaching hours and to serve as Elon’s director of planned giving, continuing until 1992, the same year in which he was named president emeritus. Should you walk across the Elon campus today and encounter Dr. Danieley, he is likely to be with a student or group of students as he shares with them the experience of his years and his love for Elon University. And those students will carry Dr. Danieley’s memory with them for the rest of their lives.